After reading the comments it seems that he is looking for validation for his photographs in terms of “likes” and favorites. It is easy to fall into the trap of having lots of followers who give feedback to feel like you are moving in the right direction. But this is an ugly trap. Social media, be it Twitter, Facebook, Google, Flickr or whatever, will not give you the feedback you need and most likely crave. (Let’s be realistic, we all have egos that enjoy an occasional stroking.) I talked earlier about the sheer volume of photos posted daily to FB and G+ here. With this volume of photographs being posted you need to find your motivation from within yourself or from with the work you are doing. It’s near impossible to be seen in this onslaught of imagery. Lets face the harsh reality, more than likely you will be making work that no one really cares about except you. So stop chasing “likes,” chasing followers, chasing the latest photo trend and create the work that makes you happy. If it’s photos of babies and cats, then make them the best photos they can be. Be it toys or water droplets it doesn’t matter…the only one who is setting the rules is you. And you know what, if you do the work you love, you never know who is going to start following you. Sometimes miracles do happen. I used an image of a Chima because I have noticed that they usually get 50-100 less “likes” on Instagram than any other image I post. If I was going for the most likes per image I wold post only Teenage Mutant Ninja Turtle photos. 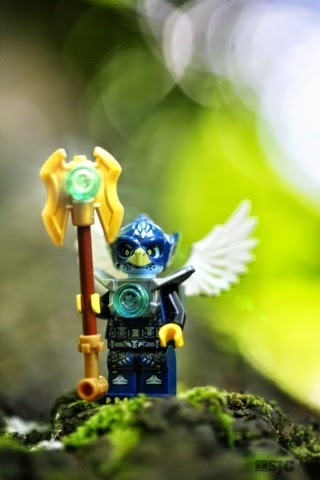 But I love Eglor and all the characters of the Chima tribes and I will continue to explore my universe with them. Thank you for your perceptive comment. You are absolutely right, the viewer can always tell the difference. If the photographer is having fun then the viewer will too! Didn’t that poor Sparkles the unicorn get fewer likes than anything? And chased away followers? Nonetheless, he had his dedicated fans who were sorry to see him go. Anyway, your point is important, and you stated it well. Various people have suggested I give up my Instagram stories because they’re taking too much time away from my other writing, but I haven’t been able to bring myself to do it. I’m having too much fun with the minifigs, and I know that at some point these story threads will work their way into a book.